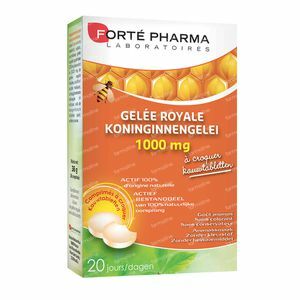 Forté Pharma Royal Jelly 1000 Mg 20 tablets order online. * in accordance with applicable regulations on organic production methods. - Organic Royal Jelly: the result of a remarkable amalgam of the work of honey bees and the plant world, Royal Jelly is a highly nutritious concentrate produced to nourish queen bees and giving them incredible longevity. - Organic Tasmanian Honey: Derived from pollen in Oceana, in particular Australia and New Zealand, Tasmanian Honey has been recognised for its numerous beneficial effects over many centuries. A dietary supplement with royal jelly and tasmanian honey to boost the immune system. - Take 1 vial of Gelée Royale Bio 1000 mg every morning, either pure or diluted in water. - Due to its high concentration it is quite normal that the formula does not always pour easily. Shake before use. - Follow the recommendations for use. Do not exceed the recommended daily dose. Keep out of reach of small children. - Not recommended during pregnancy, breastfeeding or for children under 8 without your doctor's consent. - Don't hesitate to ask your chemist for advice. Gluten free, GMO free.